I don’t know what to say about Hoy. I have a hard time describing it in a rational and coherent manner. But I will try. I loved every minute of this day. 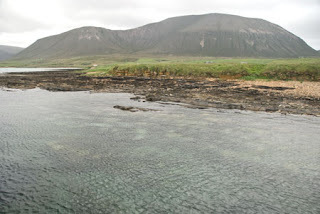 Hoy is has best place names: Moaness, Nose of the Bring, Candle of the Sale, White Breast, White Chest, Too of the Head, Bay of the Tongue, Flossy Groups, Burn of the Greenheads, The Needle, Candle of the Sneuk, Red Hill of the Sneuk, Moss of the Whitestones, and Tuaks of the Boy. You have to love a place with names like that. 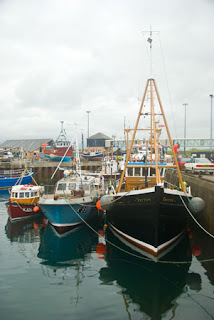 We took a ferry (more a tiny sort of tugboat type of thing) to Hoy. Rain clouds surrounded the island. We all hoped the rain would hold off and since we wanted it to, it did. The ferry was a lot of fun. 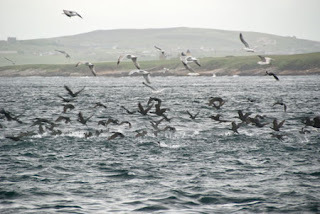 There were seals and bonxies and gulls all over the place. Watched fulmar razor-winging along the waves. 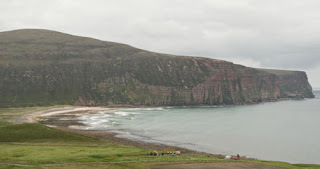 We took a short taxi/bus ride to a drop off point near Rackwick. We began our climb through heathered moors and massive hills (Moor Fea and the Stourdale Plateau) on the way to the Old Man of Hoy. In all we would do about eight miles this day. 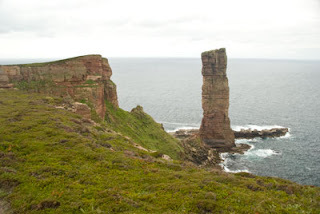 The Old Man of Hoy is 450 foot sea stack, the tallest sea stack in Europe. 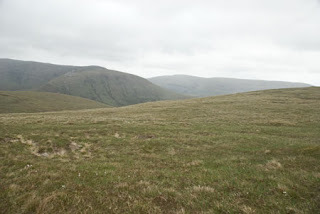 North of the Old Man lies St John’s Head, the highest vertical cliff in Britain. When you climb out onto the cliffs nearest the Old Man you are standing on the aforementioned Tuaks of the Boy. 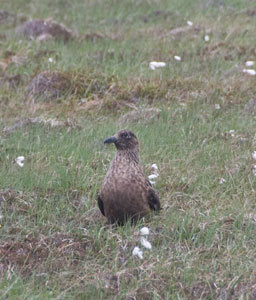 We then cut east across the moor where colonies of Bonxies nest. 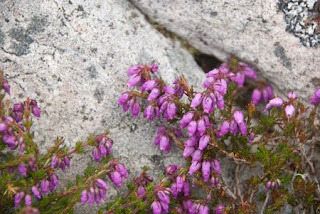 This was the most challenging part of the walk, across heather and moss and hare holes and sudden fissures just waiting to twist an ankle or knee. 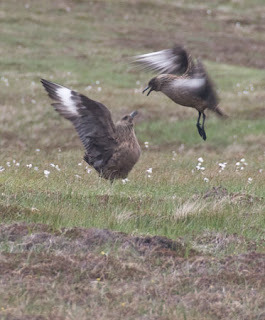 It was great fun stomping along trying to keep one’s balance at the same time keeping an eye on nesting Bonxies. I do love these snarky brown splotchy birds. 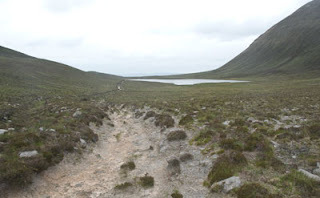 We headed up and over the heights of Hoy and then down along the edge of the Berriedale woodland, the largest extant section of the ancient forest that once covered Orkney. We ended up clambering down into a gully, where much tumbling and falling ensued, The burn at the bottom is clearest stream you will ever see. Then we had to pull ourselves out of the gully, literally, and walked along the foot path at the top, following the stream. And down we went into the glen between Ward Hill and its sister peak. 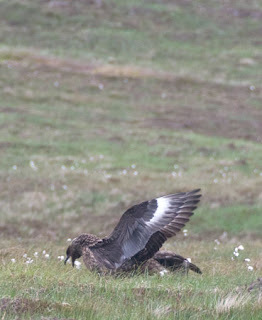 As we neared Sandy Loch we heard, and then saw, Red-throated Divers. What eerie and unsettling calls they have! Non-breeding bonxies filled the center of the loch and were busy bathing, flapping and jostling each other about. We eventually reached the road to back to Moaness. We had tea and scones at the Beneath Hill Café. On the ferry ride back we saw Shag exploding out of the sea. I also saw one Gray Seal quite close to the ferry. 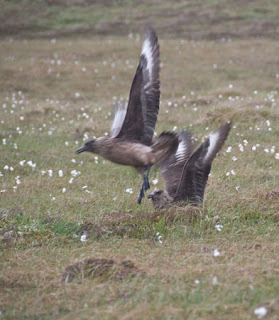 The only other person who seemed to notice was a member of an Italian film crew, who said something to me about it, but I have no idea what because I’m not sure it was in English, or, more-likely, my head was still filled with Bonxie cries. Back at the farm we were all very happy to see that Sarah had been busy making that most fantastic assortment of pizzas. We ate six. holding the ever threat of rain above. stone stack eroding slowly into the sea. 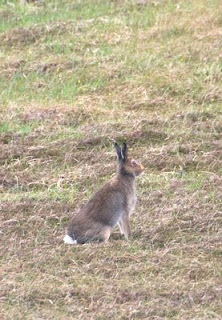 and the hares and grouse blend in. I love scotland , i love the mountains there . 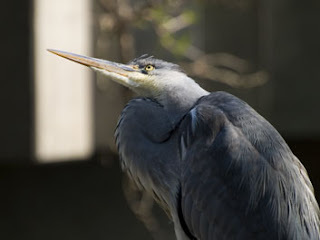 I desperately need a better camera so that I can capture birds like you can. I am seriously envious that you saw an orca! I'd love to visit Orkney, I visited Skye earlier in the summer and it was one of the most spectacular places I've ever seen. The Scottish islands are wonderful.